Learn how to customise your project workflow, so you can communicate progress in a way that better reflects your content workflow. Your project workflow is the set of statuses that can be applied to pages to communicate their progress. The default workflow will depend upon the Project Type that was selected when the project was created. A project workflow can be unique to every project in your account. 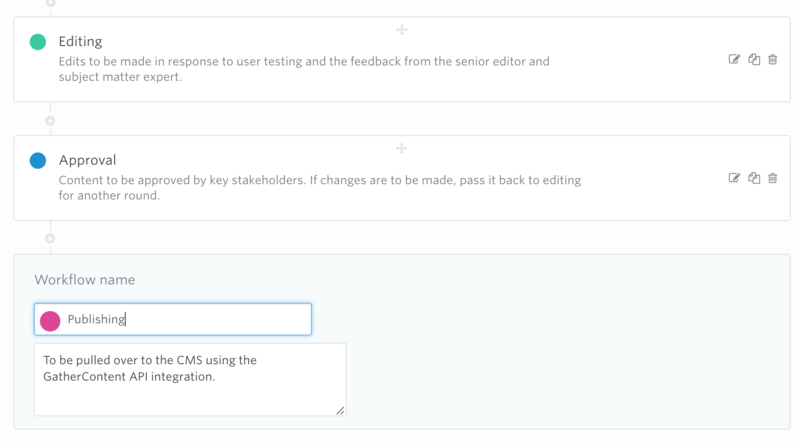 Customising your project workflow allows you to communicate progress in a way that better reflects how you, and your team work on content. It’s like the check-points a piece of content needs to go through before it can be considered ready for publishing. You can consider things like SEO, legal reviews, export processes and other stages of content development. You can reorder statuses by dragging the arrows to the left up and down. You can add a status in between others by clicking the small plus symbol between statuses. You can choose a name and a colour for your status. Once your new status is created it can be applied to pages and will be visible throughout your project. 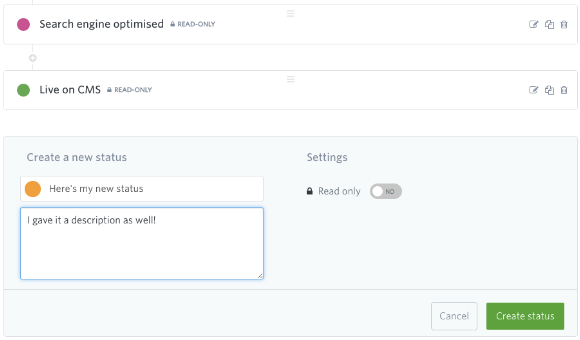 You can also set a workflow status to be 'read only', using the toggle button. This means that no one will be able to edit the content of an item while it's at this workflow status. #1: You should note that if you delete a status that is applied to pages, the pages in that status will be reverted to Draft or the first status in the workflow.